The Sustainable Angle sat down with one of our sponsors the Lenzing Group to talk about their new sustainable innovations. We have the pleasure of showcasing  this forward-thinking company at the 7th Future Fabrics Expo 24-25th Jan’18 (Tickets available here: http://bit.ly/2i1ie3d). The Lenzing Group have worked with some of the world’s best known fashion brands, and are constantly bringing out new innovative materials for the textiles industry such as Ecovero™, Refibra™ and Tencel™ to name just a few of the well known fibers they produce. specialty player in the botanic materials market derived from sustainable wood sources. TENCEL™ Luxe eco-botanic lyocell filaments are made from wood pulp, which is made from sustainable wood in line with Lenzing’s strict Wood and Pulp Policy, offering superior aesthetics, performance and comfort level that allow them to be the perfect partner with other noble fibers such as silk, cashmere or wool. The smooth surface TENCEL™ Luxe gives fabrics a silky smooth feel and liquid-like drape for the most sensual silhouettes. Feel free to visit us at The Sustainable Angle’s Future Fabrics Expo, where we will present a variety of fabrics made with Lenzing fibers! TSA – Which blends do you think are the most successful, Refibra or is it 100% Tencel that is your favourite – maybe because it is guaranteed biodegradable? 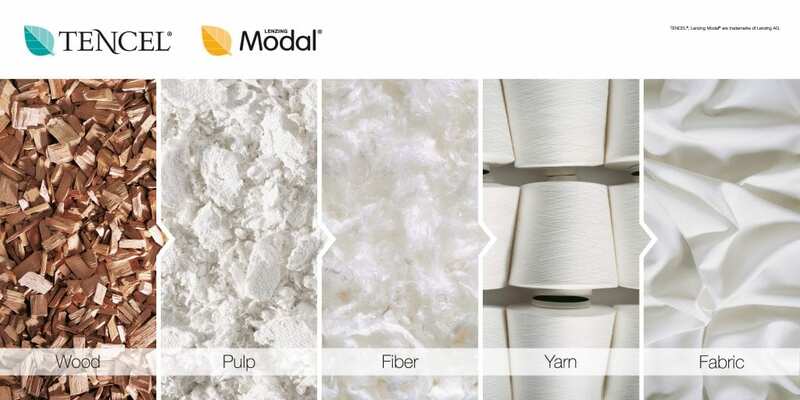 Both fibre types are biodegradable and based on the closed-loop lyocell production process. However RefibraTM branded lyocell fibers as a special fiber within the lyocell fibers family – due to the usage of cotton scraps from garments production as a raw material – offers a solution to the textile industry on circularity. TSA – Lenzing Group has continuously innovated, pushing boundaries over the last few years – where do you see the future going ? Lenzing further investigates new products and business models. One of these topics points to solutions for the re-usage of actual garments as a raw material for our RefibraTM fibers. TSA – Lenzing has so many different segments that it is working in from personal hygiene products to interiors to shoes components, where do you see the biggest growth in the future with consumers becoming more aware of the negative effects of their shopping habits? We intend to grow in all segments of our business. As the fashion industry is being watched closely by NGOs we support further circular business models and cooperate with brands in their sourcing along the whole value chain. TSA – With the Ellen MacArthur foundation’s latest report “A new textiles economy: redesigning fashion’s future’ where Lenzing Group was a partner, there is a renewed call for action and collaboration in the fashion industry. Where do you see the main obstacles to this taking hold as fast as possible? The fashion industry is going through challenging times and it is not easy to make a whole industry to change from one day to another, it will take time. It is a long journey and we are very proud to support the industry on this trip with offering solution on a fibre base and giving direction with valuable supply chain partners.